Grammy nominated and Berklee College of Music’s Visiting Scholar in the American Roots Program, Bruce Molsky stands today as one of the world's premier old-time fiddler and one of the defining virtuosi of Appalachia's timeless folk music traditions. In addition to a prolific solo career, Bruce has performed recently at the Towne Crier with his new group, Molsky's Mountain Drifters. He also frequently joins genre-busting super-groups and artists such as Andy Irvine & Donal Lunny's Mozaik, and has recorded as a special guest on legendary guitarist Mark Knopfler’s latest CD, Tracker. In a career that has now encompassed four decades, acclaimed banjo innovator Tony Trischka has created an endless array of new possibilities for the five-string banjo. While he has mastered nearly every element of the instrument's stylistic history — from old-time modal clawhammer to the most intricate melodic modern styles — it was folk music initially, and bluegrass music in particular, that first drew him to the banjo. In addition to his banjo playing superstar status, he also produced Steve Martin’s Grammy nominated Rare Bird Alert record (Rounder). Michael Daves was born in 1977 in Atlanta, Georgia. Soon after, he began to make loud noises, so his loving parents put music instruments in front of him. It was a good plan. He grew up in that grand tradition of staying up late and singing real loud. Although he's since moved north, the humid South remains in heart and sinus cavities. 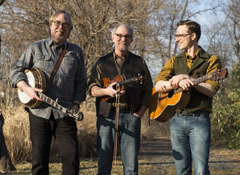 Heralded as “a leading light of the New York bluegrass scene” by the New York Times, Daves has garnered attention for his work with Chris Thile, Steve Martin, Tony Trischka,\ and Rosanne Cash in addition to his solo performances.